Is there a way to filter out any frequencies higher than the maximum one? After reaching the half sample rate frequency, my leds are doing some strange flickering. I am not sure what your problem is, the digital filter is supposed to do what its name says: filtering out the higher frequencies, so your LEDs should not react to frequencies higher than the cutoff. 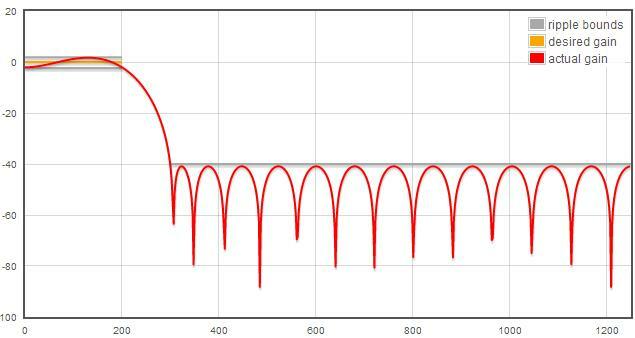 One important thing is to check what your actual sampling frequency once all the code is uploaded to Arduino, if the frequency is not what you used to design the digital filter, then you will need to re-design the filter again, and re-measure the sampling frequency, in an iterative process, until you converge. I’ve been searching for a project like this for some time now so I was really happy to find your blog. But I can’t get it to compile. No matter where I place #include “LowPassFilter.c”, the compiler says it doesn’t exist. I’m on Windows 7 Home Premium and using an Arduino Nano. I’ve also tried the last three or four versions of the IDE and some third-party alternatives. No joy. First create two new files in the Arduino Sketch. You can see hoe to do it in the Arduino manual: “A sketch can contain multiple files (tabs). To manage them, click on the right-facing arrow just above the scroll bar near the top of the environment.”. Call them LowPassFilter.c and LowPassFilter.h (or whatever). Then design your filter on TFilter, then click on “source code” (top left side of the webpage) and copy the content of “SampleFilter.c” and “SampleFilter.h” to your LowPassFilter.c and LowPassFilter.h. That should be it. I must be doing something bone-headed. I’m using Arduino 1.6.1 and although there is no “right-facing arrow just above the scroll bar near the top of the environment”, there is a down-facing arrow that let’s me manage tabs. I’m trying to take this one step at a time so I can try to understand what I’m doing. Or doing wrong. What?!? So I’m right back to where I started. 😦 Does that make sense to you? I don’t know, if you have added the files, and copied the content of the source of TFilter it should work. I can’t help more than this here. This works very well, I liked your tutorial a lot. Just a note, you need to reset index inside the if(index == 1000). I got it figured out. Just needed to rename some labels. Now the fun *really* begins. Thanks! My question is: Can you replace the microfone with an audio jack? Do i then still need to amplifie the signal and is ther still the problem with the noise? Hi, you can definitely just plug an audio jack but you have to do 2 things: 1) share the catode (usually the “sleeve” of the jack) with the Arduino ground pin and 2) be sure that the signal comes in the 0 to 5V voltage (use a multimeter to see what’s the maximum voltage of your signal). I would then have a signal range from 0.4 V is that enough for the program to work? and dos this not blow up my Uno? You would definitely need a voltage divider to raise the mean to 2.5V and maybe also an amplifier, as otherwise you signal will vary only between 2.3 and 2.7V. Is it a library “LowPassFilter.c “/ Where can i download it? Can you help me please to generate code for clap. It high value from 0-4500 Hz and from 18 000 Hz to 21 000 Hz.